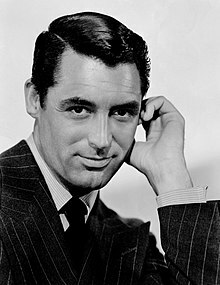 Cary Grant (January 18, 1904 - November 29, 1986), born as Archibald Alexander Leach in Bristol, United Kingdom, was an actor in the United States.. He starred in many movies, including 1959's North by Northwest. Grant became an American citizen in 1942. At that time, he legally changed his name to "Cary Grant." He died of a stroke on November 29, 1986. His body was cremated. ↑ 1.0 1.1 "Cary Grant's Body Cremated In California". Orlando Sentinel, December 2, 1986. ↑ van Matre, Lynn (April 10, 1989). "The Unseen Faces of Cary Grant". Chicago Tribune. Chicago, Illinois. Retrieved May 22, 2016. ↑ Abrams, Garry (March 24, 1989). "Shadows on a Legend: Cary Grant's Image as the Perfect Hollywood Heartthrob is Sullied in Two Competing New Books Portraying a Darker Side to the Star". Los Angeles Times. Los Angeles, California. Retrieved May 22, 2016. ↑ McCann, Graham (1997). Cary Grant: A Class Apart. London: Fourth Estate. p. 13. ISBN 978-1-8570-2574-3. ↑ 6.0 6.1 Nelson, Nancy (2002). Evenings with Cary Grant: Recollections in His Own Words and by Those Who Knew Him Best. Citadel Press. p. 290. ISBN 978-0806524122. This page was last changed on 1 January 2019, at 16:06.